TCell odour control systems from Blackwoods have taken clean smelling washrooms to a new level by delivering a precise dose of designer fragrance and odour neutraliser for 60 days without the use of batteries. TCell is a range of continuous odour control systems incorporating a special fuel cell, which creates hydrogen in the fragrance chamber. As each molecule of hydrogen is created, it forces an equal volume of fragrance out of the chamber and natural air flow distributes the fragrance throughout the washroom. 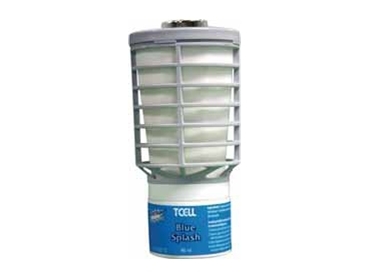 TCell odour control systems are offered by Rubbermaid who claim that conventional gel-based systems lose fragrance intensity during the life of the refill. On the other hand, their system is designed to deliver a consistent level of fragrance throughout the refill life of 60-90 days with each unit covering an area of up to 170 cubic metres. The decorative range of slim wall-mountable odour control dispensers ensures a perfect fit for any décor, while refills with a wide range of fragrances can be fitted in less than a minute.